Correspondence between Congressman Bob Dole and Paul Conrad, a representative of the National Newspaper Association. Conrad writes on behalf of the organization, which represents nearly 7,000 publishers and editors in all 50 states, to thank Dole for his support in the wake of the passage of the Freedom of Information bill. Conrad, Paul. 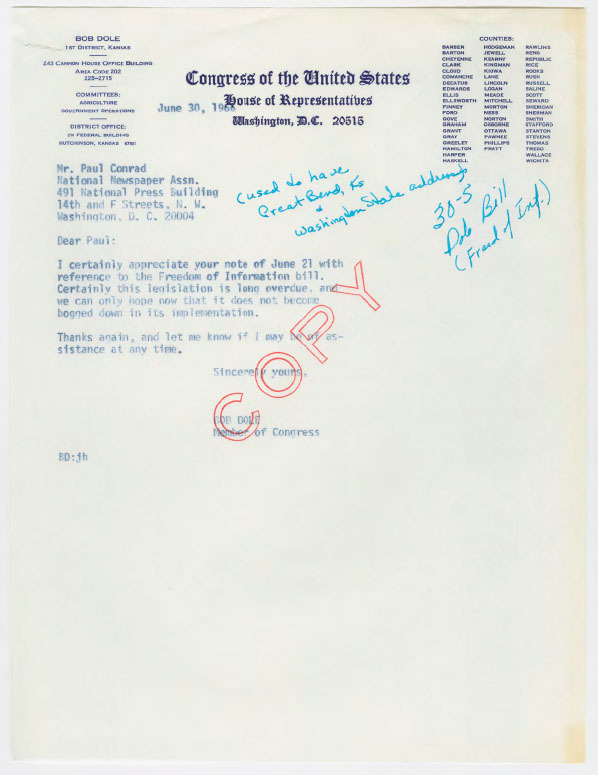 "Correspondence between Paul Conrad and Congressman Bob Dole." Robert J. Dole House of Representatives Papers, Box 189, Folder 1, Robert J. Dole Archive and Special Collections, University of Kansas. Accessed 19 April 2019. http://acsc.lib.udel.edu/items/show/377.